To be honest I’m a creature of habit, especially if the light is bad (as it was today, grey and bland), so if I want to get out and get some exercise, and maybe take some photographs too, I often walk along Priddys Hard, Gosport. If you install Google Earth, you can download the .kmz file I created today with my Qstarz GPS Photo Tagger, follow my track, and have a look at some photos I took too. 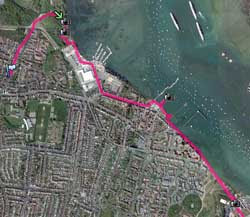 Download my .kmz track file for Priddys Hard, Gosport.